Very early blooming, single pinkish coral fading to cream with lavender flares. Newly introduced by Fina Gardens, Maleah's Joy is a Rockii tree peony that is extremely winter hardy with large double pink blooms. Our new catalog offerings start January 1st. Order early for best selection! Fina Gardens Peony Nursery Is a premier home of root divisions for hundreds of varieties of the most stunning and sizzling peony flowers for sale to beautify your gardens. Whether you are looking for peonies to enhance the landscape around your home or for cut flowers that bring some of nature’s most gorgeous blooms into your living spaces or to share with friends, Fina Gardens is no doubt the one-stop shop for the peonies to fit your needs. Our spectacular array of herbaceous peonies include some of the earliest flowering species in the spring garden, including the much sought after fernleaf garden peonies, which tolerates extreme cold conditions and thrives in well drained soil. Other late blooming herbaceous varieties such as Ann Cousin, Jacorma and Lady Kate extend the bloom season. 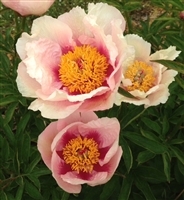 The ITOH Intersectional peonies we offer include some of the creations of top hybridizers such as Roger Anderson, Bill Seidl and Irene Tolomeo. These intersectional peony flowers for sale are especially suited to landscape design since they stand up well to all sorts of weather without the need for support. Fina Gardens’ selection of rock garden peony flowers feature attractive flowers and interesting foliage on compact plants that are at home in cozy places. 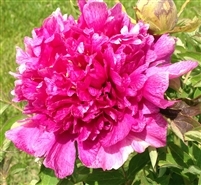 For nearly any type, species or color of peony flowers, Fina Gardens offers all at affordable prices. Make your garden and home attractive today with a flowery touch by ordering our peony plant root divisions, which will be shipped to you in the prime planting window for your region of the country. Reserve your bulbs now as many of our varieties often sell out early. Copyright © 2013 Fina Gardens LLC. All Rights Reserved. Built with Volusion.